Brighouse Town returned to the top of the Evo-Stik NPL’s first division north table with a 2-1 win at Droylsden yesterday. They went one point ahead of Bamber Bridge, who were held 2-2 at Hyde, with their sixth win from seven games this season. 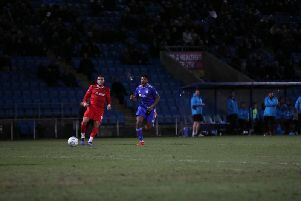 Ex-Leeds United reserve striker Luke Parkin got both goals, the first after just two minutes. The razor-sharp Parkin cashed in on a defensive error and curled the ball past the home ‘keeper. A Sam Hewitt own goal after 21 minutes got Hyde on terms but Parkin prodded home what proved to be the winner 17 minutes into the second half. Paul Quinn’s side will bid for a fourth away win of the season when they travel to play Scarborough Athletic on Tuesday. Scarborough are fourth after a late penalty gave them a 1-0 home win over Colne yesterday.